His Holiness Brahmrishi Shree Kumar Swamiji was born on 22nd of January 1954 in Karanpur, Rajasthan, India. He has dedicated his whole life to freeing the world of all suffering and misery and his vision for society is continually being delivered by his Trust – “Bhagwan Shree Lakshmi Narayan Dham”, one of the world's largest spiritual organisations. His efforts in improving human welfare for people of all faiths and religions have inspired millions. 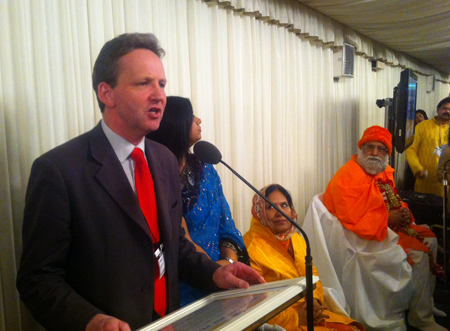 The event last night was organised by the Bhagwan Shree Lakshmi Narayan Dham and hosted by The Rt Hon Stephen Timms MP to welcome His Holiness Brahmrishi Shree Kumar Swamiji to the UK. In attendance will over 150 people, including prominent individuals, community & business leaders from London, Midlands and the North together with MPs and Lords. His Holiness Brahmrishi Shree Kumar Swamiji is a well rehearsed scholar in Aryuveda, India's five thousand year old system of medicines. He has demonstrated his moral leadership and outstanding record of service to the global community by delivering large scale conventions in India, Canada, America, UK and throughout Europe, which are attended by tens of thousands and watched by millions across the globe. His Holiness Brahmrishi Shree Kumar Swamiji has more than 500 million followers across the World. His Holiness’s Trust – “Bhagwan Shree Lakshmi Narayan Dham” is one of the largest spiritual institutes in the world today with the core mission being the human welfare at a global level. The Trust has become a ray of hope to millions - bringing health, wealth and happiness to people. Incurable diseases have been cured by the Secrets of Ancient Traditional Science. Those who had lost all hope in life have regained their hope to live. Started as one man's mission, today the institute is spreading globally. The little seed that he sowed has transformed into a huge banyan tree; a tree that has become the last resort to millions of people. 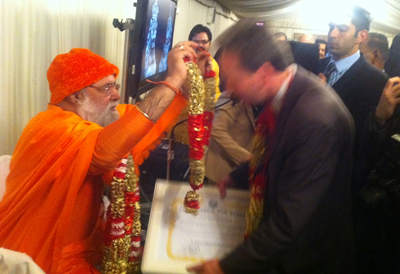 His Holiness has been given international recognition and has received various awards. Recently, he was honoured on Monday 2nd May 2011 by the New York Senate. This day became a golden milestone in Indian History as it was the day when a new chapter was added to the history in the land of United States of America. For the first time in the whole history of India, an Indian Saint was invited to be honored in the New York State Senate. It is the vast magnitude of his worldwide work for the human welfare that inspired the New York State Senate to felicitate him by passing a resolution in His honour. His Holiness Brahmrishi Shree Kumar Swamiji also addressed the Senate. In addition, His Holiness was presented the “Mahaveer Award” by The Young Indian Vegetarians Society in recognition of His Holiness' vegetarian lifestyle and compassion towards all living beings. There was also an announcement of an Annual Day, November 15th, “Brahmrishi Shree Kumar Swami Day” dedicated in honour of the interfaith, charity and volunteering work that His Holiness Brahmrishi Shree Kumar Swamiji embodies. On this day each year, all followers in the UK will perform selfless voluntary acts of kindness and public service and do something positive that makes a meaningful difference to someone else’s quality of life, happiness and prosperity, by sacrificing their time without any gain or reward. They will be encouraged to engage in various volunteering projects to help out in charitable organisations, schools, old people’s homes, hospitals, hospices and in particular consider giving blood or joining the organ donor register.